Ripley's Haunted Adventure is a scary-good Halloween experience that is open all year round for ghastly fun whenever you feel like a good scare is necessary. Be sure to bring all of your bravest friends and family to brave the haunted halls and make your way through each of the rooms, each decorated and themed to poke at your darkest fears. Waiting to greet you just outside is a live actor who is just a torso attached to a spine, sitting in a massive, raised chair. Other monsters come out of their home to 'greet' you and welcome you to their domain. The mansion is home to a wide range of characters, from evil clowns and ghoulish stalkers to ghostly apparitions and plenty of special effects props and sound effects to make even the bravest in your group scream. Make your way through the winding corridors of the mansion, bearing witness to bloody body bags hanging from the ceiling and the Headless Horseman and his trusty steed. The clowns and green faced zombies will jump out at you and stalk you through the Haunted Adventure...Just don't look over your shoulder! Ripley's Haunted Adventure is the perfect destination for the Halloween Lovers in your family and circle of friends. Be sure to bring everyone alone for the fright of a lifetime, and come back every year for even more thrills than before! What is included in the admission price for Ripleys Haunted Adventure ? Includes admission to the haunted house. 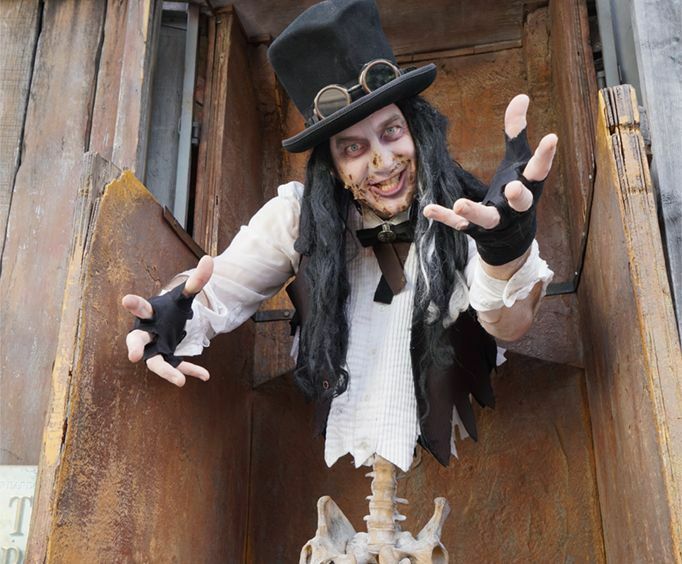 Approximately how long could a customer plan to spend at Ripleys Haunted Adventure ? Is Ripleys Haunted Adventure handicap accessible? For what ages is Ripleys Haunted Adventure appropriate? Must be over age 6 to enter. Is parking available at Ripleys Haunted Adventure ? Is it free?